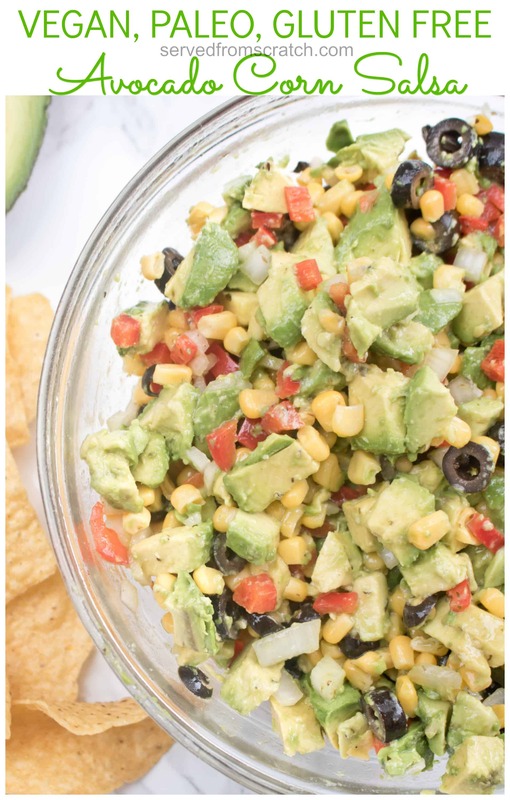 Avocado Corn Salsa: Healthy, flavorful, fresh, bright, vegan, gluten free, paleo, and nut free. 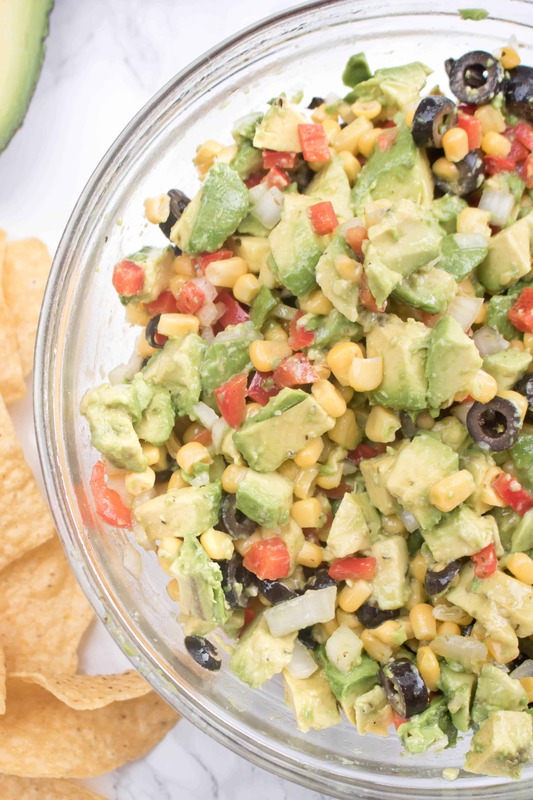 The perfect crowd pleasing party snack! Do you have a go-to, have-to-make, your-friends-just-always-expect-it, kind of a dish? Well, if you don’t, once you make this salsa and share it with your friends and family, you will. 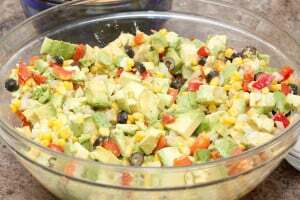 That’s what Avocado Corn Salsa is in our house. It’s a favorite. It’s a staple. It’s the one thing that is on every party and BBQ menu. 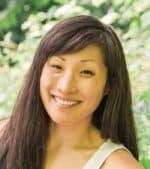 Then there’s the best part: It’s ok for every special diet. It’s vegan, it’s paleo, it’s nut free, and it’s gluten free. And most importantly, it’s freakin’ tasty. Then, the second most important thing, it’s super quick and easy to make. First, the dressing. Just some fresh lemon juice, dried oregano, salt, apple cider vinegar, olive oil, pepper, and lots of fresh minced garlic. So fresh, light, and bright. Then it’s added to a big bowl of corn, diced red peppers, diced white onion, and sliced black peppers. See all that fresh garlic? Don’t worry, seriously everyone loves this salsa so you’ll all be in good garlicky company. The final touch, lots of avocado. 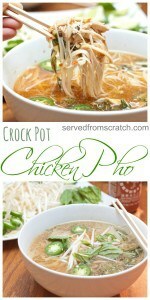 Give it a a good mix and you have a big bowl of an amazing combo of flavors. 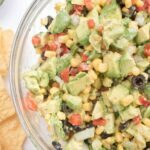 Creamy avocado, soft briny olives, sweet crunchy red peppers and onion, and then a perfectly medium textured corn all mixed with a dressing that’s salty, tangy, garlicky, citrusy. 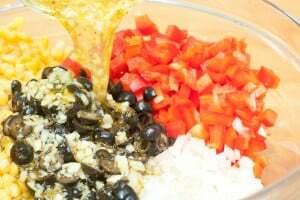 In a large bowl, mix the corn, olives, red bell pepper, and onion. 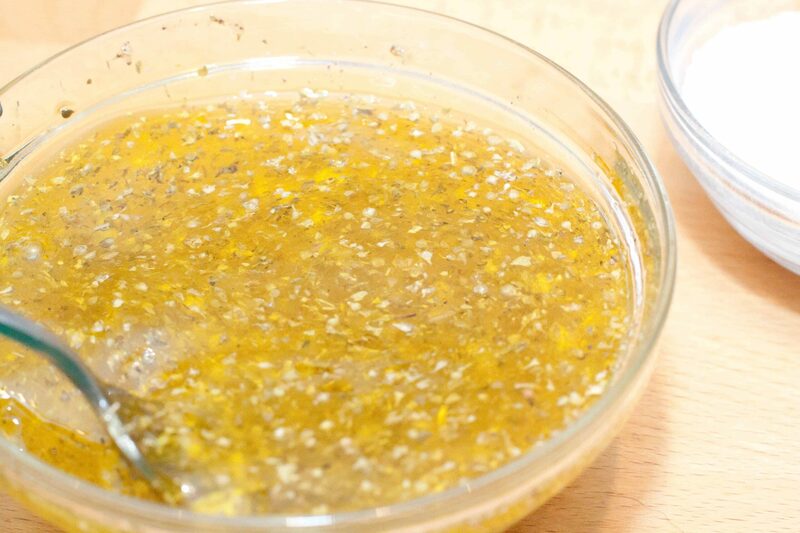 In a small bowl, mix the garlic, olive oil, lemon juice, cider vinegar, oregano, salt, and pepper. Pour into the corn mixture and toss to coat. 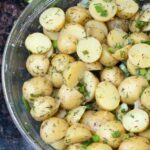 This can be covered and stored in fridge overnight. An hour before ready to serve, add cubed avocado and mix well. Make Ahead by mixing all ingredients except avocados, cover, and put in fridge. Can be done the night before. Then just add avocados right before serving. This looks wonderful! So refreshing, I love avocado anything! 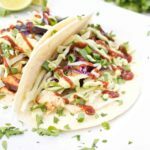 Thanks for linking up in Try a Bite Tuesday Link Party!! 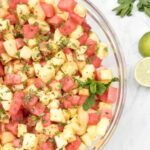 This salsa looks amazing! I love fresh salsa and love avocados. My request is my guacamole. Thanks, Julie! 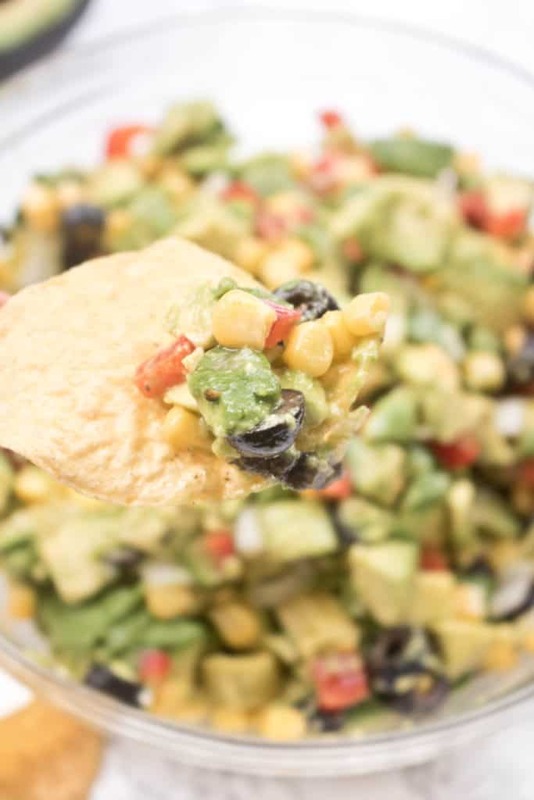 Mmm guacamole… there’s something sooo summer about fresh avocado salsas and dips! 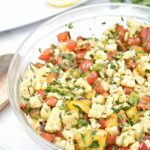 I can think of a lot of ways to use this yummy salsa! What a delicious idea for a salsa. I love avocado so this is a must try. 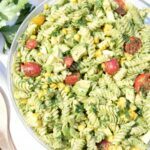 I love avacado, so this tasty dish of yummy food sounds perfect. 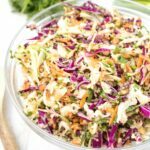 The dressing is simple to make, and sounds like the perfect accompliment to the fresh ingredients of the salad. 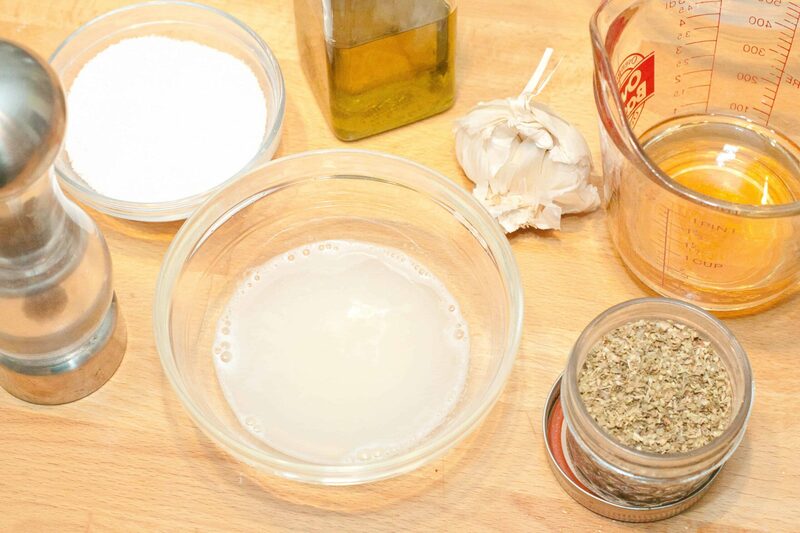 I think that my favorite part of the whole recipe is the dressing. It looks amazing. Top-notch to be more specific. The texture, the color – everything. I will need to give it a try, that’s for sure. I was thinking of making tacos tonight – this would be great with them. Thanks!